Primary Flight Display based on the look and feel of the Primary Flight Display used in Boeing 777 aircraft. 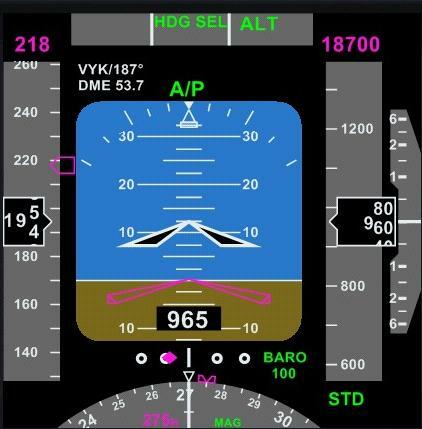 Displays moving speed tape, and current airspeed window, a speed trand vector, and optional V-speeds (set via the FMS). A speed bug symbol is displayed when in range of the speed tape, and a digital speed bug is displayed at the top. Displays moving altitude tape, and current altitude window, an altitude bug symbol is displayed when in range of the altitude tape, and a digital altitude bug is displayed at the top. Displays a rotating 80 degrees heading arc at the bottom, a heading bug symbol is displayed when in range of the tape. A digital heading bug is displayed at the bottom. A while current track symbol line is displayed over the arc. Displays current vertical speed via a white vector line. The digital vert speed is also displayed above and below the VSI (in even hundreds). Displays the ident, course, and dme of currently tuned Nav radio.